"Any and all applicants for admission shall be considered on an equal basis after giving due regard to their scholastic preparedness and their ability and desire to meet the standards of the school." 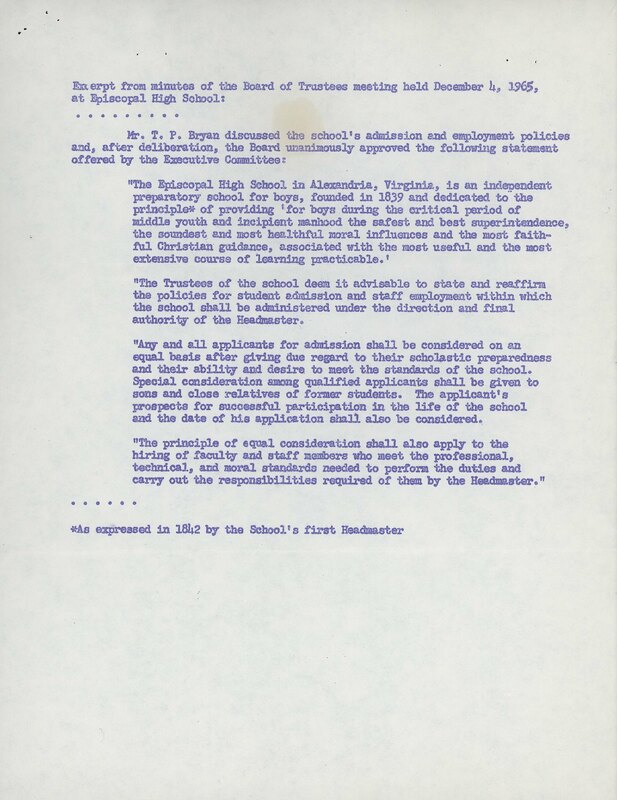 In 1965, ten years after Brown vs. Board of Education required public schools to integrate, Episcopal's Board of Trustees unanimously voted to view all applicants for admission equally, no matter the student's race. At the time of the board vote to change the admissions policy, the interests of current parents, alumni, and future administrators represented the various board members. According to correspondence from Headmaster Hoxton to various alumni, this decision had been discussed at the school for at least "five years" before the board finally adapted the admissions policy. During the years prior to integration, teachers abided by Episcopal's mission statement to "prepare young people with the intellectual and moral courage to pursue lives of ethical leadership and service as citizens" of an evolving world by questioning and challenging students thoughts on integration. This pattern of preparing and molding the student body in an evolving world is demonstrated by Episcopal bringing in a range of speakers, like Virginius Dabney and Sarah Patton Boyle, to introduce the student body to a variety of opinions on current events, including integration. Look below to see an announcement of the board's unanimous vote.